Spring is fast approaching. If you missed liming during the fall there is still plenty of time. Bio-Liquid Calcium is a liquid form way to provide the same results as lime but in a faster more effective way, all while being on average half the cost of dry lime. Liquid Calcium can be applied with a standard sprayer, without worry of corrosion or clogging up the sprayer. In this form the calcium is immediately available to the soil and goes to work right away raising soil pH and releasing needed bound up nutrients in the soil to the plant. Often lime does not breakdown enough to even provide the soil with the correct amount of needed calcium. Bio-Active Liquid Calcium is the purest way to lime the soil without the impurities and breakdown time of crude dry lime. Liquid Calcium has been studied and proven by 9 land grant universities that back the effectiveness of liquid calcium in fixing soil conditions and improving growth. AgriTec is a family owned company since 1976, and has helped thousands of farmers around the country over the years, save money on lime and fix soil pH. Soil pH is primarily an indicator for many combined issues in the soil. These issues can equate to seriously decreasing soil production and decrease the output of your fields. Calcium has many rolls in the soil and the plant, aside from directly affecting pH. Calcium is responsible for nutrient availability and uptake to the plant. 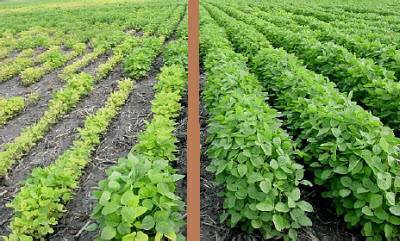 Decreased soil pH can reduce the availability of nutrients in the soil by as much has 50%. When calcium is applied, and pH is raised these nutrients are released and become available to the plant, providing much better growth. This issue also directly affects fertilizer, when fertilizer is applied to low pH soil, half of that fertilizer is wasted and will not be available to the plant. This equates to wasted money and lost production potential. Grain: As many farmers know, not having the proper nutrients in the soil can break a crop and seriously hurt production. Soil pH plays a big factor in this equation, because improper pH indicates a nutrient imbalance in the soil. When calcium levels get too low nutrients can't move properly to the plant. Bio-active calcium is best applied early in the spring before planting, to raise low pH levels and boost the crop straight from green up. Weeds: Low soil pH also results in increased weed growth. These pests like broom sage or sage grass can be eliminated when soil pH is corrected. Bio-Liquid calcium has proven to rid fields of weeds and prevent germination of things such as sage grass. 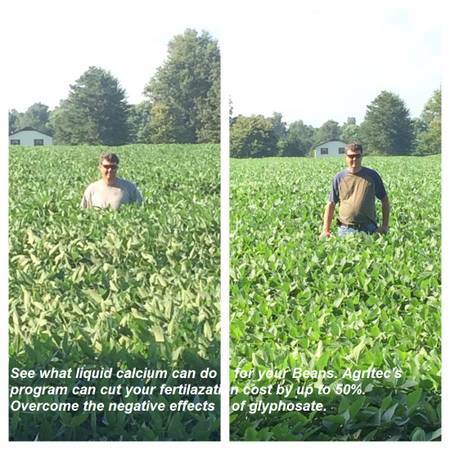 Liquid calcium not only saves on the cost of lime but can decrease fertilizer costs and herbicide costs, and most importantly increase plant growth and output. Users have consistently seen up to a 45% increase in production on hay, corn, beans, alfalfa, wheat and more. Pro-Cal: Liquid calcium for raising soil pH and liming soil. Applied with a sprayer, concentrated and purified to get rid of the impurities of dry lime, and eliminate breakdown time. Advanced-Cal: Liquid calcium for liming the soil mixed with micronutrients and organic matter to boost plant photosynthesis and increase carbon energy in the soil to boost root growth, and yield of the crop. Bio-Act: Mixture of 72 trace minerals and micro-nutrients. Provides a boost to growth and output of on average 30%. Form 14-72: Blend of 14% nitrogen and 72 trace minerals and micronutrients. Works great on corn, hay and pasture to increase nitrogen in the plant resulting in dramatic growth increase. Why use tons of lime on your fields that won't be available to your soil or plant for at least six months to a year or more when you can use 2.5 - 3 gal of Bio-Active Liquid Calcium per acre which is 100% available after being applied. This is the best way to treat winter cover crops or prepare for next years growth. "I wanted to let you know this was a field that we separated and treated half with your liquid calcium last fall. To say the least I am very impressed. We got 7 round bales per acre off this field and last year it was only producing around 4 bales per acre. Thanks again!" - John K.
Liquid Calcium is the most effective way to lime soil, and can save hundreds if not thousands of dollars on the cost of trucking and spreading dry lime. AgriTec's products have been proven to work time and time again. Servicing over a million acres a year and growing. Join the thousands of other farmers in using liquid calcium to manage your soil pH, and liquid fertilizers to restore needed nutrients to the soil. AgriTec will ship your order directly to you at no additional cost. Call to speak with a local soil adviser for pricing and more information on using liquid calcium to raise your soil pH levels and add liquid fertilizer to your growing program to more effectively add nutrients to your soil. WE DELIVER DIRECT TO THE CUSTOMER.